Sikhism is the fifth-largest religion in the world. The Sikh religion is also one of the newest and has only been in existence for about 500 years. About 25 million Sikhs are living around the world. Sikhs live in almost every major country. About half a million Sikhs live in the United States. 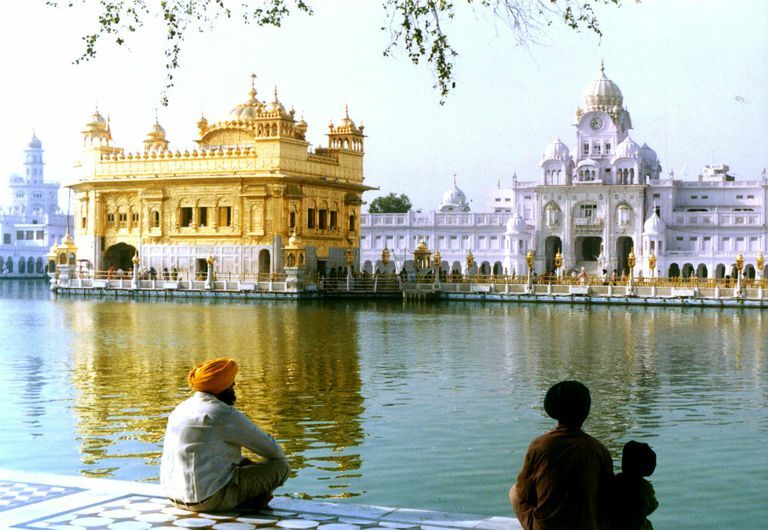 If you are a newcomer to Sikhism, and curious about what Sikhs believe, here some common questions and answers about the Sikh religion and Sikhism beliefs. Sikhism began around 1500 A.D, in the northern part of ancient Punjab, which is now part of Pakistan. It originated with the teachings of Guru Nanak who rejected the philosophies of the Hindu society that he grew up in. Refusing to participate in Hindu rites, he argued against the caste system and preached equality of humanity. Denouncing the worship of demigods and goddesses, Nanak became a traveling minstrel. Going from village to village, he sang in praise of one God. Sikhs believe in one creator inseparable from creation. Part and participle of one another, the creator exists within creation pervading and permeating every aspect of all that is. The creator watches over and cares for creation. The way to experience God is through creation and by meditating inwardly on the divine character of the manifest self which is in tune with the unmanifest and illimitable, creative infinity known to Sikhs as Ik Onkar. The ten founders of Sikhism are considered by Sikhs to have been spiritual masters or saints. Each of them contributed to Sikhism in unique ways. Many of the texts in the Guru Granth advise the seeker of spiritual enlightenment to seek the company of saints. Sikhs consider the scripture of the Granth to be their eternal Guru and therefore the saint, or guide, whose instruction is the means of spiritual salvation. Enlightenment is considered to be an ecstatic state of realization of one’s divine inner connection with the creator and all of creation. Sikhism’s Holy Scripture is known formally as Siri Guru Granth Sahib. The Granth is a volume of text containing 1430 Ang (parts or pages) of poetic verse written in raag, the classic Indian system of 31 musical measures. Guru Granth Sahib is compiled from the writings of Sikh Gurus, Hindus, and Muslims. The Granth Sahib has been formally inaugurated as the Guru of the Sikhs for all time. Prayer and meditation are an integral part of Sikhism necessary to reduce the effect of ego and bond the soul with the divine. Both are performed, either silently, or aloud, individually, and in groups. In Sikhism prayer takes the form of selected verses from Sikh scriptures to read on a daily basis. Meditation is achieved by reciting a word or phrase of scripture repeatedly. Sikhism teaches a belief in one divine essence having no one particular shape or form, which is manifest in every one of the countless myriads of forms of existence. Sikhism is against worshiping images and icons as a focal point for any aspect of the divine and does not relate to any hierarchy of demigods or goddesses. The proper name for the Sikh place of worship is Gurdwara. There is no particular day set aside for Sikh worship services. Meetings and program are scheduled for the convenience of the congregation. Where the membership is large enough, formal Sikh worship services may begin as early as 3 am and continue until about 9 pm. On special occasions, services go on all night until daybreak. The gurdwara is open to all people without regard to caste, creed, or color. Visitors to the gurdwara are required to cover the head and remove shoes and may have no alcohol of tobacco on their person. In Sikhism, the equivalent to baptism is the Amrit ceremony of rebirth. Sikh initiates drink an elixir prepared from sugar and water stirred with a sword. Initiates agree to give their head and sever ties with their former way of life in a symbolic gesture of surrendering their ego. Initiates adhere to a strict spiritual and secular moral code of conduct which includes wearing four symbols of faith and keeping all hair intact forever more. Sikhs do not proselytize or seek to convert those of other faiths. Sikh scripture does address meaningless religious rituals, urging the devotee, regardless of faith, to discover the deep and true spiritual meaning of religion values rather than merely observing rites. Historically the Sikhs stood up for oppressed peoples subjected to forced conversion. Ninth Guru Teg Bahadar sacrificed his life on behalf of Hindus being forcibly converted to Islam. The gurdwara or Sikh worship place is open to all people regardless of faith. Sikhism does embrace anyone regardless of caste color or creed who wishes to convert to the Sikh way of life by choice. In Sikhism tithe is known as Das Vand or tenth share of income. Sikhs may give Das Vand as monetary contributions or in a variety of other ways according to their means including gifts of goods and performing community service which benefits the Sikh community or others. The Sikh scripture, Guru Granth Sahib, makes references to demons mentioned in Vedic legends primarily for illustrative purposes. There is no belief system in Sikhism which focuses on demons or devils. Sikh teachings center on ego and its effect on the soul. Indulging in unbridled egoism may render a soul subject to demonic influences and the realms of darkness which abide within one’s own consciousness. Transmigration is a common theme in Sikhism. The soul travels through countless lifetimes in a perpetual cycle of birth and death. Each lifetime the soul is subject to the influences of past deeds and is cast into existences within various realms of consciousness and planes of awareness. In Sikhism, the concept of salvation and immortality is enlightenment and liberation from the effects ego so that transmigration ceases and one merges with the divine.